There seems to be a great debate in this country when it comes to Chicken and Dumplings. 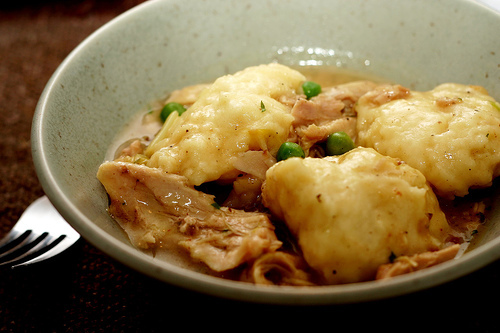 The basic recipe for the chicken, vegetables and broth or gravy is pretty much the same all over, but it's the dumplings that have had serious home cooks arguing for decades. Some people swear by the rolled out and cut strips of dough that are added to a somewhat thinner broth with cooked chicken, carrots, onions, celery and a myriad of other vegetables when it's at a rolling boil. They turn out something like a plump "noodle" that also serves to thicken the broth a bit. Then you have the lighter (hopefully) fluffy dumpling that is made with the same flour and fat and liquid ingredients as the noodle style dumpling, that's not rolled out and cut, but rather placed by the spoonful on top of the meat, vegetables and a usually thicker gravy as it is boiling. So, as I'm sure you've already guessed, the following recipe is for the chicken and dumplings with the spooned dumplings. There are two different ways to prepare it. One is a quick version that I make 99% of the time and the other is the more traditional "from scratch" version which entails making your own chicken and stock and your dumplings from scratch instead of a biscuit mix. I can certainly post the scratch version if anyone would like it. Feel free to ask any time! A Double Batch of Biscuit Dough, made with your favorite boxed mix, according to directions for "drop biscuits". I use Bisquick. In a large heavy dutch oven, (with plenty of surface area) melt butter over med-high heat and add flour. Stir with wooden spoon or use a whisk until the butter and flour are combined thoroughly and there are no lumps. Add a pinch of salt and a couple of grinds of pepper and whisk continuously as mixture cooks a bit to get rid of the raw flour taste. Cook to a medium golden brown color. Add the broth/stock and continue to whisk constantly, bringing it to a boil until it is completely smooth and begins to thicken slightly. Turn heat down slightly and add the chicken, vegetables and dried herbs. Let simmer until vegetables are tender. While the base is simmering, in a large mixing bowl make the bisquit dough according to the package directions. If I have any in the fridge, I'll add some fresh chopped parsley and chives or maybe a dash of onion powder and dried parsley flakes to the dough to give the dumplings a little extra zing. Serve immediately for the dumplings to be at their very best. It reheats quite well, but any left over dumplings will have soaked up some of the gravy and become a bit heavier. We don't usually have any of the dumplings left over around here anyway! If I have a good amount left the following day I'll often add more stock to the left over base and just bring it all to a bubbling simmer again and make a fresh batch of dumplings. Or you can freeze the leftover base for another time to use for Chicken and Dumplings or even Chicken Pot Pies. Oh Mrs. B! I am so glad you are back! 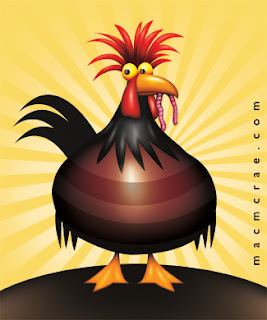 I love love love the blog! Oh, it is so wonderful! And I love chicken and dumplings with the big 'ol dumplings rather than the string dumplings. And I don't like peas, either. Yeah! Can't wait to see more! It's good to be "back", Sue! I'm so glad you stopped in and thank you for being my very first follower here in my new home!!! It feels like Christmas morning! So... You don't like peas either? I knew we had a ton of things in common! Hope you're having a marvelous Sunday! I have to say I call the fluffy ones dumplings and the thin rolled out ones noodles. I Really Need Some Spring! Spring Farmers Markets Aren't Far Away!